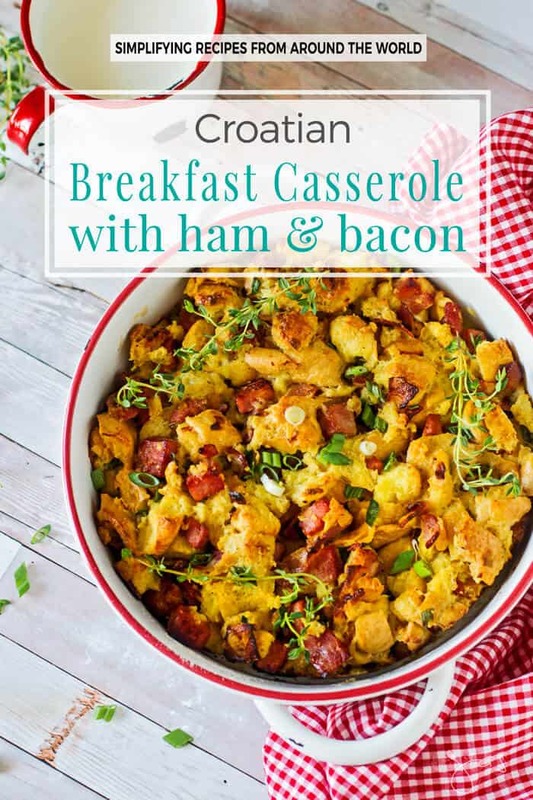 If you like planning ahead then you will love this Croatian breakfast casserole. 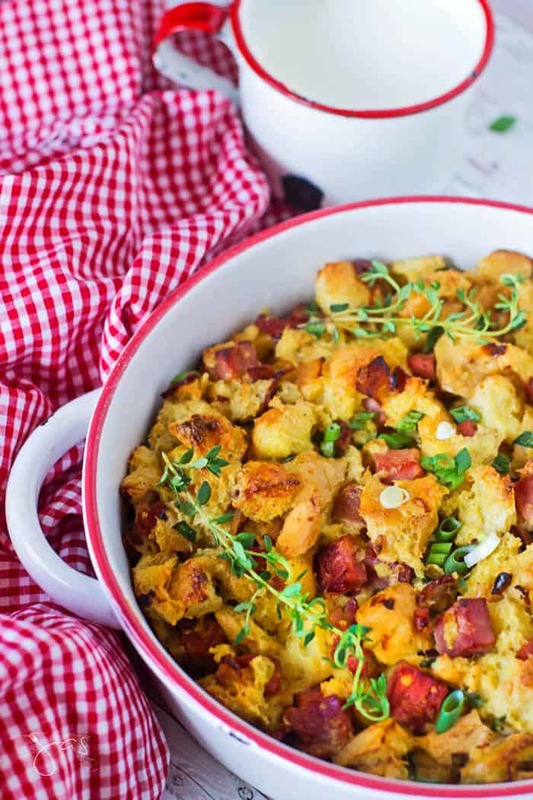 Traditionally served on Easter Sunday, this dish combines leftover or fresh bread, ham, and bacon. They are mixed with eggs and baked to a golden perfection. Best of all, it can be prepared the night before which is perfect for taking the stress out of a holiday morning. 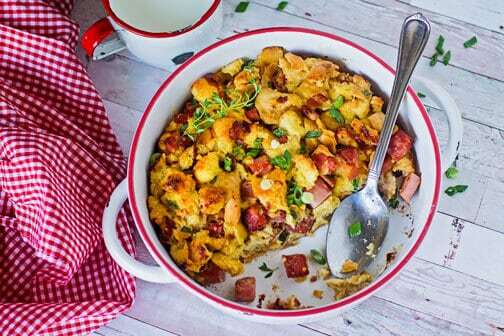 Whenever I was sent to stay with my aunt Jelica in Delnice, she would make this casserole for Sunday breakfast. I actually ate everything my aunt put in front of me, to my mom’s delight, partially because I was a shy little girl that obeyed her aunt and partially because the fresh air from this mountainous region of western Croatia really worked wonders. When everything else failed in attempts to make me eat, doctors would recommend the change of climate for a couple of months, to my delight. It really helped my anorexia for the time being (if you’re not familiar with my eating disorder, you can read about it on my about page). I pretty much only saw my aunt on those occasions and I always gained a few pounds while I stayed with her. 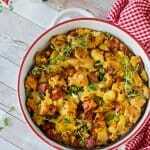 This bacon and ham breakfast casserole and potatoes with swiss chard are still my favorite dishes from Croatia. My cousins were older and off to college so I didn’t have anybody to play with. The aunt dragged me with her everywhere she went while my uncle worked or was out hunting. From the early hours of chilly mornings, we were weeding the garden, harvesting the veggies, combing the woods in search of edible mushrooms, walking a couple of miles to the little grocery store, hanging laundry on the clothesline, ironing, and making lunch. The evenings were more relaxed, visiting with the neighbors that usually gather outside until the day cools off again and surrenders to the night. No wonder I had an appetite there. I spent most of the day outdoors, breading the clean air of evergreen trees. My aunt’s log house was in a secluded, tiny neighborhood called Lučice, surrounded by tall pine trees and mountains. I feared the nights there, as they were pitch-black and always brought howls of wolfs that echoed from behind the trees. But boy, how I miss it! So again this Easter morning, I’ll serve aunt Jelica’s breakfast casserole with ham and bacon and reminisce about summers at her log house. That’s what I call pure comfort. Preheat oven to 375 degrees Fahrenheit. Grease a small casserole dish. In a large bowl, add the bread and milk. Set aside to soak. Meanwhile, in a non-stick skillet, fry the bacon until crisp. Stir in the white parts of the scallions, ham, thyme, salt, and pepper and cook until heated through, about 3-5 minutes. Pour the beaten eggs over the bread and add the green parts of the scallions. Gently mix in the ham and bacon mixture and put into prepared casserole dish. Bake for 30-40 minutes or until eggs are set and the casserole is golden brown in color. Garnish with fresh thyme, sliced scallions or chopped parsley. Serve with sour cream. 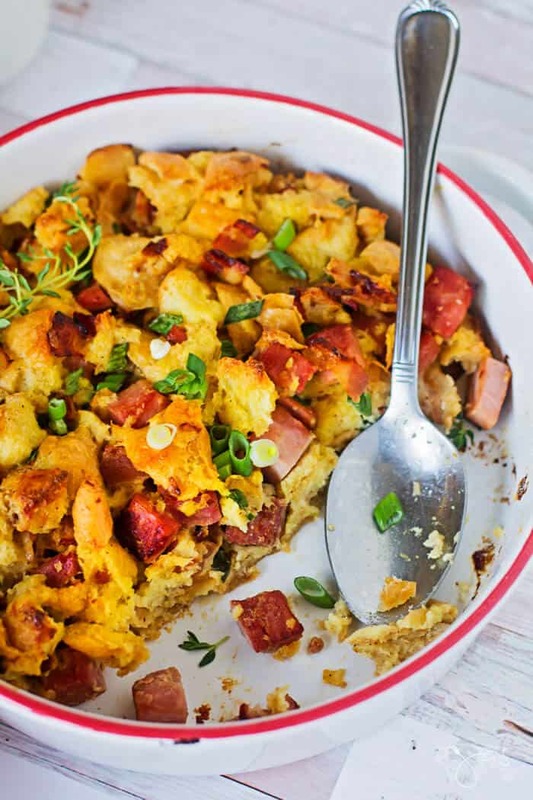 The ham and crispy bacon make this Easter breakfast casserole a pure comfort dish you can enjoy any day. Featured on: Marilyn’s Treats and Grandma’s House DIY. This looks FANTASTIC, all of my favorite things in one bowl 🙂 I was sorry to read about your health history, but the way you described the mountains, and especially the pine trees was wonderful. I dearly love the smell of pine trees myself! I will keep an eye out for your recipes! Looks so yummy! Pinned to try for Easter Morning! Thank you for sharing on Merry Monday! Hope to see ya next week! Sounds yummy! 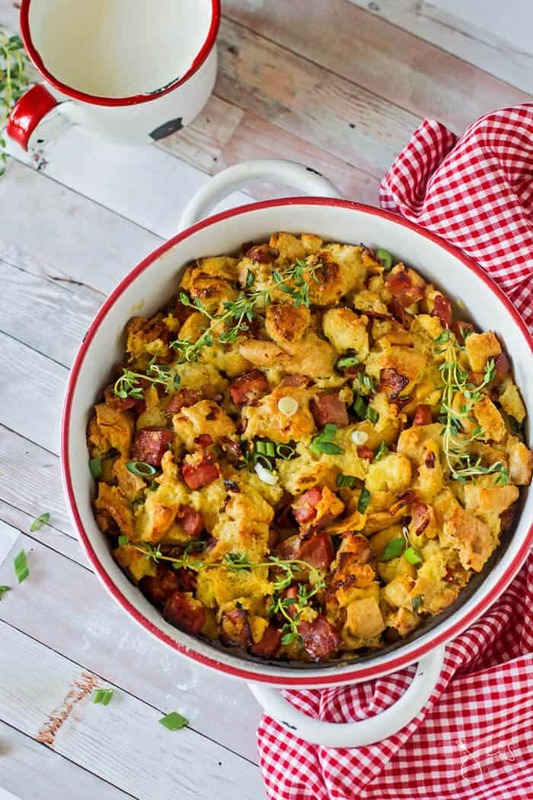 I love a breakfast casserole now and then. Thanks for sharing the recipe with SYC. Thank you, Michelle! Your kind words mean a lot. Have a blessed weekend! I love egg dishes like this and the combo of ham and bacon sounds so good. Pinned. What a great breakfast, so tasty! Hope you are having a great weekend and thanks so much for sharing your great post with us at Full Plate Thursday! Glad you like it. Hope your weekend is going great too! I’m always on the look out for recipes like these. Great job and thanks for sharing on To Grandma’s House We Go! What a wonderful casserole, Jas! I can see why you have such good memories of it. I know my family would love this! I was interested to read of your struggle with anorexia. I had anorexia in my teens, but it was the other kind. It’s so ironic, that once you wanted to eat, food was scarce. You really did go through a lot, and I’m so glad that life is so much better for you now! Thank you so much for sharing this recipe – and a little bit about yourself as well – with the Hearth and Soul Link Party. Scheduled to pin and sharing. Happy Easter to you and yours! Hope to see you at the party again this week. This looks so pretty and sounds just delicious! I can see why you have such good memories of it! Thanks for sharing with Party in Your PJs! Looks like a great and hearty breakfast I certainly can enjoy!!! Thanks! Happy you like it! Thanks for stopping in. Thanks, Matt! 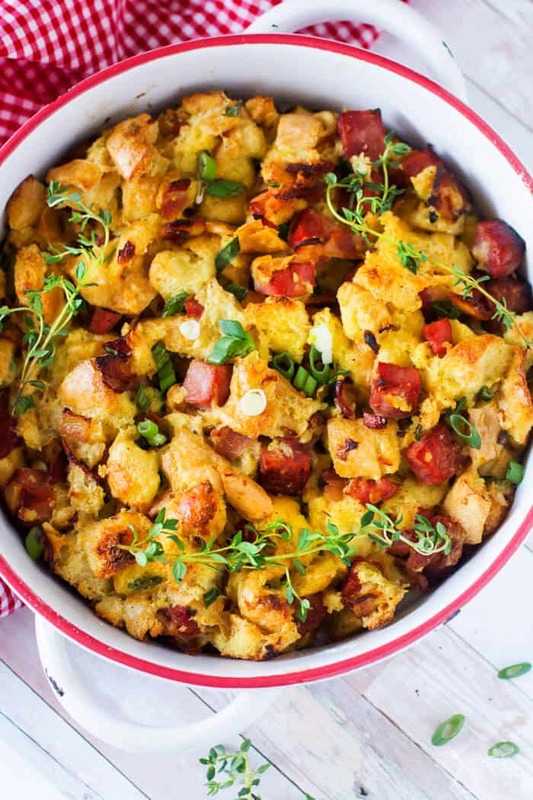 Since it is your better half’s birthday, I’d suggest you serve her this as a breakfast in bed and not dinner 😉 Turkey bacon is fine, of course, but there are plenty healthier and birthday-worthy recipes for dinner you can find here to impress her with if the breakfast in bed is not possible. Happy browsing! Love the recipe and can’t wait to try it. I need to double it for a brunch party. Would it bake OK in a 9 x 13 pan? Thanks! !